By Prof. Kenneth Keenan, Ll.B., Ph.D., FCIB. 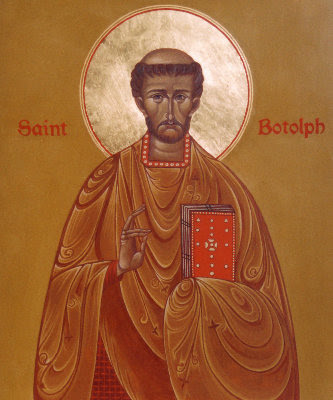 St Botolph – greatly venerated as the most influential missionary of the seventh century, founded a monastery in 654, appears to have led a peaceful life and died in 680. His feast is still venerated in the dioceses of Brentwood, Nottingham and Northampton on 17 June each year. The actual life of St Botolph is shrouded in mystery and conflict. It is my hope that this short (and inadequate) account of his life and times will give you a glimpse into England in the Seventh Century and more especially, into the life of Botolph - Man, Priest, Abbot and Saint. Many references are made to the building of a monastery at Ikenhoe in 654 and its destruction in 870 and most of the information concerning these events is scant and confused. Writers have followed each other’s assumptions without thought or care, that Ikenhoe was in Lincolnshire, there is no real evidence to support the Boston (Botolphs Stone) tradition or that Wikanford (a Lincoln suburb) was the site of Ikenhoe. It must be south within the limits of the Kingdom of East Anglia. This point has some bearing on the later biographers of the brief reign of Ethelhere…Botulf was born in East Anglia and went to Germany to study the gospel accompanied by his brother Adulf. They became monks (Adulf later becoming a bishop). Botulf returned to become chaplain to a nunnery, where two of the sisters of Ethelmund, King of the Southern Angles, stayed and studied. Botulf was given a grant of land by Ethelhere (654) and Ethelmund (654-657) following prolonged negotiations. Botulf preferred untilled, unoccupied land should be given to him for his monastery. 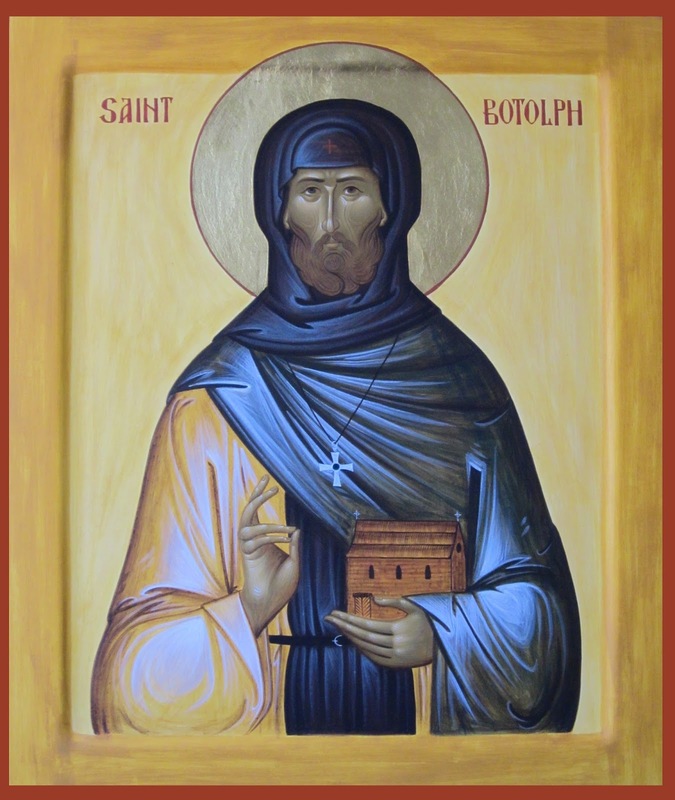 St Botolph began a monastic community based on the Benedictine way of life at Ikenhoe. In the course of the first twenty years, two major journeys are said to have been undertaken by Botolph. The first to the Thames - where he built a church in honour of St Martin. There is dispute even here over where the actual site was (on the Kentish side of the river near Northfleet or Tempsford on the Bedford Ouse) but it is the second journey, thirteen years after the building of Ikenhoe, which has gathered more importance. The journey was as a result of the need for rest following a snakebite! And resulted in two churches (St Peter and St Paul) being constructed, somewhere in East Anglia, as the grant to build came from the same King who granted the building of the monastery. In 670 Ceolfrid visited the monastery for a considerable period after his ordination at Ripon in 667. Here St Ceolfrid preached many famous sermons, inspired by Botolph's life and example. Botolph is said to have been buried in several places - this accounts for the stages in the translation of his remains on several journeys. There are references to his age and infirmities and documents suggest he was over sixty at his death. If this is so, at least 27 years of his early life are largely unaccounted for. Before Botolph returned to England in 647, he stayed at a monastery Farmoutier-en-Brie in Saxonia, where he met the two sisters of King Ethelmund - and to whom he owed his introduction to the East Anglian Court. King Annas daughter Ethelburga and stepdaughter Saethryd became abbesses of Farmoutier but so many princesses studied there and it is not possible to identify the names of the two with absolute integrity. The site of St Botolph's original monastery in Iken, Suffolk. But, where did Botolph (Botulf) originate from - the greatest unsolved difficulty in his life and times. Folcard describes him as de Saxonica Gente (of Saxon origin or nationality), but says he was loved by the Scots because he illustrated by his example what he preached from his mouth. The Slesvig Breviary contradicts this and says he was a Scot (i.e. Irish of Royal descent). The Saxon name Botwulf is not even conclusive evidence as many names were changed (Maelduib, for instance, that of the Irish founder of Malmesbury, being altered to Maidulf, and the original name may have been Saxonised into Botwulf as it was afterwards Normanised into Botolph). The name of Botolph deos not appear in the Saran Missal and is not associated in any way with the west of England, but it is found in various Calendars and Missals (see appendix). 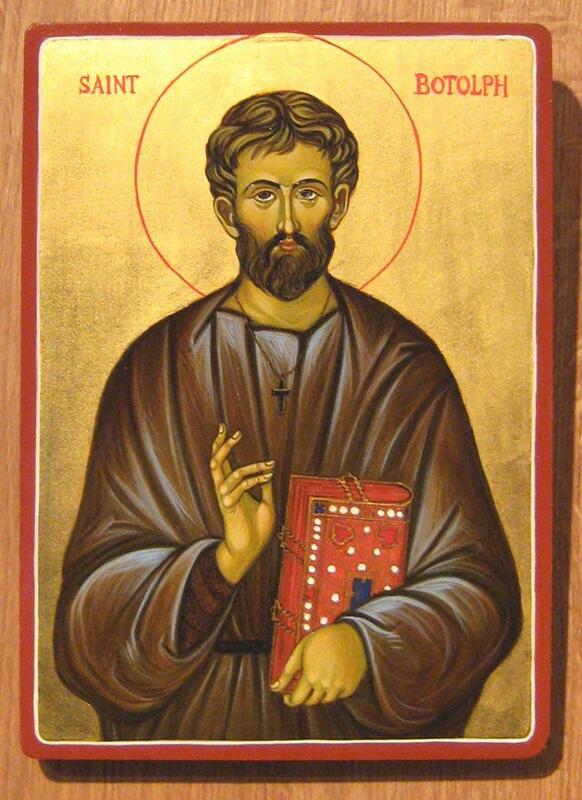 St Botolphs Day was still celebrated in Scotland until the early 14th Century. Ancient manuscripts and breviaries refer to Botolph at often conflicting times. Olaf Worm (rectory of Copenhagen Academy) in the 16th Century gives an account in his Runic Lexicon of 1650 of the appearance of St Botolph's name in Old Runic Kalendars, stating that the three days ending 17 June were formerly known in Denmark as the Botelmas or Bodelmas (St Botolph's Mass) and describes in detail a staff, inscribed in runic characters with the names of St Vitus, St William and St Botolph. The insertion of the name of St William (Abbot of Eskilhoe in the Diocese of Roskilde) shows that the staff cannot have been older than the Thirteenth Century. Whether the tradition actually goes back to St Willibrord, whose work was largely destroyed for two centuries after his death, or whether it can only be traced back to the early part of the Eleventh Century, when the Bishops of Scania, Funen and Roskilde were consecrated in 1022 by the Archbishop of Canterbury, about the time when Canute was interesting himself with the removal of St Botolph's remains is a question which cannot be answered definitely. However, the tradition is sufficiently ancient and widespread to give significant importance to the statements contained in the Slesvig Breviary. If St Botolph was really (as the Breviary asserts) of Irish birth, how can this be reconciled with Folcards ascription of Saxon origin. The technicalities of the use of words Saxon and Saxony are slightly obscure Saxon without an adjective was applied to inhabitants of Sussex then to those of Wessex and Essex. Saxonia (when applied to foreign parts) generally meant Francia. If St Botolph was an inmate of the Saxon Monastery before going to Farmoutier-en-Brie, a writer four Centuries later may have thought him to be a Sussex man (especially if his Irish birth was obscured by a Saxonised name). The existence of Botolph in Sussex as well as of Hardham and Heene (all of which have churches dedicated to St Botolph) held to support this view. At Ikenhoe, however, St Botolph applied the Benedictine Rule (not the Irish) but like him, as Folcard put it…. vetera novis miscens, et nova veteribus (the old blends with the new, and the new become old). But how did St Botolph's name reach the Slesvig Breviary - we can look at the explanation with reference to the mistake by which Folcard substitutes Adolph for Jurmin as the name of the one with whom the posthumous honours are associated. The mistake is doubtless due to the fact that Jurmins eldest brother was Ealdwulf (a king of East Anglia) and that the names of Ealdwulf and Eadwulf are often confounded and that Jurmins brother was taken to be St Botolphs brother. It is stated that Adolf was consecrated a Bishop in Frisia. If he came from Ikenhoe (and St Willibrord, the consecrating Bishop, himself a Benedictine, usually chose Benedictines as his helpers), the mistake would be more intelligible. The identification of Ikenhoe with Iken explains much that is obscure in connection with the accounts of the translation of his remains. Kind Edgar granted Ethelwold, Bishop of Winchester, permission to remove St Botolph's body from his monastery at Ikenhoe. According to ancient chronicles, the body was to be divided into three parts by order of the King; the head to the monastery at Ely, the middle to Thorney and the rest reserved for the King and subsequently presented to Westminster Abbey by Edward the Confessor. There are slight variations in other documents, suggesting that the middle went to Westminster and the remainder to Thorney (all references to the head state Ely very clearly). Other writers refer to the various resting places en route to Ely, Thorney and Westminster. For example, St Botolph's fame in Denmark is attributed to the consecration of three Danish bishops by the Archbishop of Canterbury in the same year that permission was given to remove the bones of St Botolph from Grundisburgh (where on the night of translation a light came from the funeral bier and illuminated the darkness). It is more than likely that the division of bones took place at Grundisburgh (near the spot where the roads to Thorney and Ely would diverge from the road to London). Other places on the route to the final resting place are names in various breviaries - for example, Botolph Bridge (near Peterborough) indicates a stage or stopping place to avoid the areas (at that time) under the sea. So, where is St Botolph buried - the threefold theory is the most common, but numerous shrines have been built (Abbey of St Edmund at Bury for example) in honour of St Botolph's relics. At various places in the UK, mention is made of keepers of St Botolph's relics, gilds of St Botolph, Keeper of St Botolph's Arm. In 1389 it is recorded in the Gild Certificates in London that St Botolph's gild met on the eve of St Botolph to eat bread and cheese and to drink the health of St Botolph together. 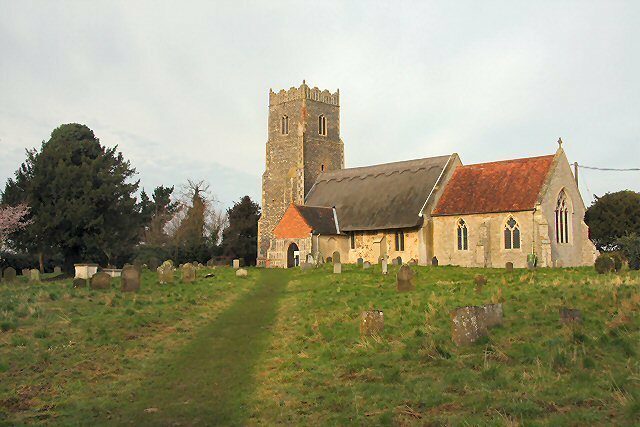 Just as St Botolph was regarded as one of the greatest of seventh century missionaries, it is worth mentioning the Hanseatic League (a medieval political and commercial league of Germanic towns) whose presence in England led to so many outbursts of anti-German feeling in the 15th century - found in St Botolphs cult a link with their own land. Their meeting place was not far from St Botolphs Billingsgate. The gate at Billingsgate which they were under obligation to repair, joined another church dedicated to St Botolph. At their Boston meeting place they came into contact with St Botolphs fair, St Botolphs church. There can be little doubt that Hanseatic influence helped to make St Botolphs feast better than in north west Germany, St Botolph's name being associated with trade and travel. According to Olaf Worm, St Botolph was associated with weather and crops (in Denmark) and according to Weever, his relics were carried in procession in connection with prayers for rain (St Edmundbury). Looking closely at more minor and often obscure writers it is clear to see that the land occupied by Botolphs monastary at Iken was once inhabited by Christians, presumably in British times. Earlier inhabitants (shown by Neolithic remains) are there only by evidence. There is little more to say regarding who they were or why they were present. St Botolphs life was tormented by demons but as to the exact nature we are unsure - varying in explanation for evil spirits haunting the land and water - ghosts, devils and even an illustrated fish-demon. The daemons at Iken may each have been a few degenerate descendants of an earlier race, but it is impossible to say what race. 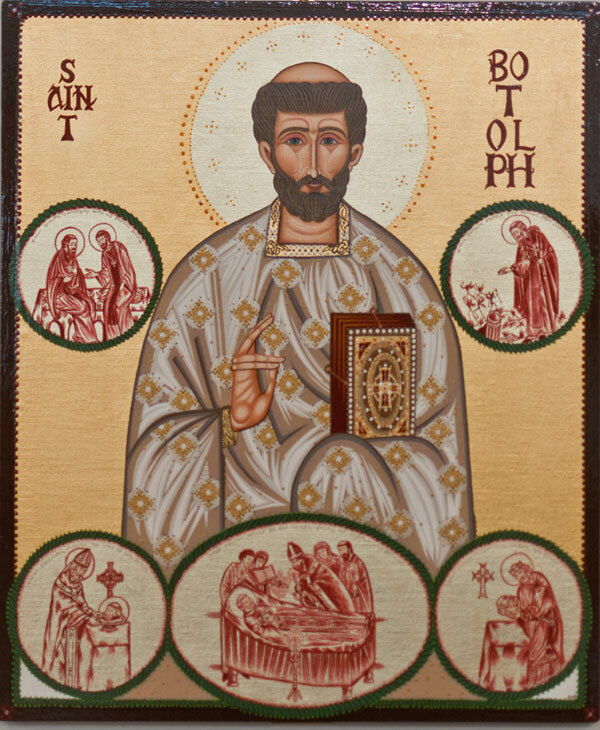 It is certain that St Botolphs life was plagued with both physical evil and spiritual evil, but he persevered unto the end in his fight against evil and oppression and gave his life willingly to God. Butler's Life of the Saints ends his brief account of the life of St Botolph with his record of a visit of St Ceolfrid, Abbot of Wearmouth, that he once journeyed to the East Angles that he might see the foundation of Abbot Botolph, whom fame had proclaimed far and wide as a man of remarkable life and learning - full of the Holy Spirit ... and that, after having been instructed as far as possible in a short time, he returned home so well founded that no one could be found better versed than he, either in eclesiastical or monastic tradition.